Australia’s Default Culture | Between a Hard Rock and a Place. 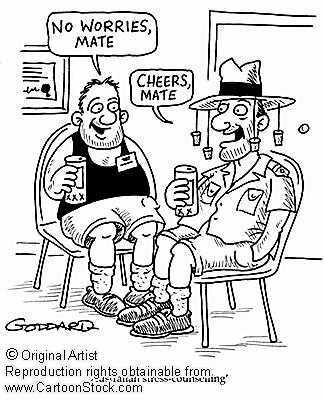 One of the main categories I will have here is Australia’s Default Culture, and the writing below on Mateship is the first of a list of things that I think are worth pondering. I don’t really think we are a pro-active culture, and it is a good thing we are young as there is always time to make changes. It seems we tend to settle for very little culturally. Our national dress is probably shorts and plastic Chinese-made Japanese-inspired thongs (flip flops). Our national food is probably a pastry and offal pie, or whatever comes off a bbq plate. Our national song is just about a guy who steals a sheep and then commits suicide, but you can sing it with your eyes closed if you like to make it more nationalistic. It all just seems… like no one could come up with anything better.